Fieldstone is a very versatile stone that can be used for almost everything; to complete your distant dream of stone sculpture or building. Kivi-Arne product range comprises of fireplaces, summer kitchens, terraces, fence-posts, pavements and smaller unique garden accessories like fountains, flowerpots etc. In addition to finished products we also offer hand split granite fieldstone and unfinished granite fieldstone. Call us or send an email and choose the most appropriate fieldstone type corresponding to your needs. 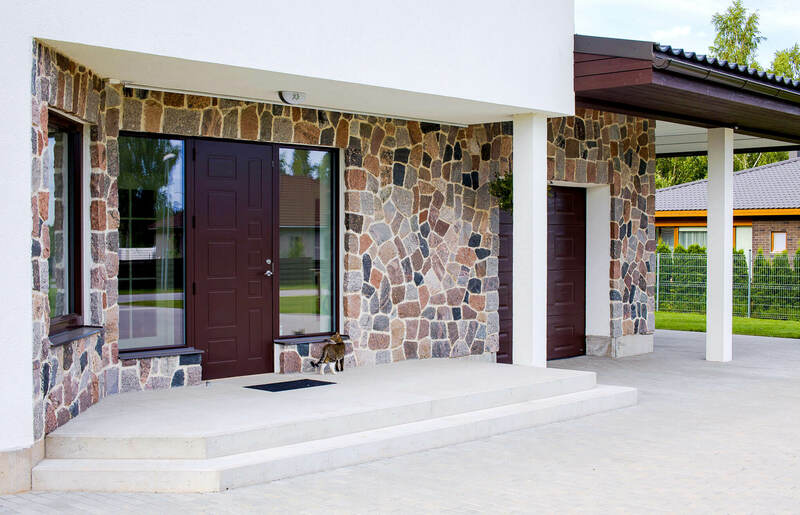 Kivi-Arne will help you in all aspects related to fieldstone constructions. Comfortable integrated solutions: discussion with the client, pre-measurement, preparation of the materials, transport to the site, and execution of works. Recommendations for protective substances and if necessary coating. Aftercare. Kivi-Arne’s heart belongs to fieldstone, the oldest building material in Estonia. In close collaboration with our clients, we aim to create the final result that fits best with the surroundings and interior. Unique products that will maintain their look through decades. We are happy that many of our clients have become our regular customers. We welcome all your questions and we are pleased to give advice, be it by phone or by email. Our advice is only a stone’s throw away! We sell high-quality German stonework tools from the company Bavaria Steinmetzwerkzeuge.